Back in February 2014, Matt Timmons-Brown captured Gordon, our Head of Software, and would not let him go to the café for his “Gordon Special” until he had spilled all of our secrets. Gordon thinking about ‘Specials” as the ghost of a Toltec shaman hoots mournfully over his shoulder. Matt is spending some time at Raspberry Pi Towers shortly and we’d like to do this again, but this time with added educationy goodness from one of the education team. So: what would you like to know about Raspberry Pi? Post your questions below. The more questions we get the more interesting the Q&A sessions will be, so fire away! Details about upcoming dsi display. If the dsi display is being developed, what are the specs and how affordable is it? what is the planning to grow the “resources” section of the website? What is the future of Minecraft? Will there be an updated version? Will it become part of the Raspian distro? Will Minecraft be updated to work over VNC for headless usage? Will there be an Arduino HAT? Gertduino is quite close to what I had in mind. Having two ATNMEL controllers is really nice. Especially being able to control some servo motors seems very cool. Both devices seem to be very versatile and a little overwhelming. I just received a regular Arduino Uno R3 and will play around with that for a start. Any questions about the foundation’s future plans. Any and all future plan that involve hardware. You guys are way too quiet with this kind of stuff (positive criticism because I love you). I think I discovered a hint towards the next generation of Pi when I read the announcement of the B+ model (at least between the lines ;) ). Is there some kind of roadmap you could share with us? Keep up the great work! I’m totally hooked on the Pi! It all started last spring when I was looking into new ways for training young qualified IT specialists. Now I’ve got 4 model B and 2 model B+ (in addition to those we bought for our trainees). How is the Raspberry Pi being received by teacher/schools? Have you seen any course work being provided by the attendees of the Picademy? Which capabilities and ways of working are resonating with teachers? How is the Raspberry Pi being used in Primary Schools and Secondary Schools? The Resources section on the site looks the same from when it was launched. There have been many great uses of the Raspberry Pi since the launch any plans to add more resources? Keep ’em coming people! I have no plans to let any of them go before a good quizzing! Are there any “international” plans on the education part ? I mean is there some interest from the education system in other countries than U.K., with whom you will cooperate (native english speaker or not) ? And don’t forget to congratulate them all for us ;). Could you confirm if the header under the b+ is for the videocore and what header would have been used (to help the elinux guys)? When will the ‘Raspberry Pi dinner set’ made from real Pi’s be available? How is the Maynard Desktop and the Ephiphany Browser coming along ? Will we get XWayland support ? Thank you for your hard work and greetings to the rest of Pi team ! More info on the official display would be great, as well as any other projects they’ve got in the pipe line. plans for minimal/opensource bootloader for VPU? official assembler/linker fo VPU to build it? BCM2835 is mobile chip(? ), is suspend to RAM/sleep/standby possible with low power draw / long standby time on battery with B+/A+ models with better power management? Is this software or hardware issue? Yes, I would also like to know if minimal/opensource bootloader for VPU is being planned! Will there be any more specific development of educational resources that teach about using the Wolfram and Mathmatica environments that the Raspberry Pi NOOBS and Raspian OSes have included? What’s happening with Scratch performance improvement? Now that Scratch 2.0 is released open source are there any plans to port it to the Raspberry Pi? How is PyPy coming along? RISC OS – is it a priority for the Foundation or only a fan supported implementation? Any plans for a software stack that gives more direct access to the GPIO pins for better timing and control for robotics and timing sensitive applications? Linux is great but gets in the way of precision. What’s the best project you have seen so far? What feature would you like to see on the next Raspberry Pi? This could work when there is good accelerated html5 browser. I know that C.A.P. was involved in working out the cost/benefits ratio of R.P.s in the classroom (particularly, in her last job). Further, I realize that the RPF has been donating a lot, but what is the current budget recommendation for funding a school’s lab environment? Has this seen a reasonable amount of penetration in the school environments that you can reach directly? When will the completed version of the maynard desktop come out? Are there any long term plans to like double the speed of the arm proscesser, like in a model c or d cause I think that would be the number one thing you could do, just make it feel a little more fast and fluid. I am interested in a Pi that runs faster. As are lots of people. But specifically I have some Java code that runs a model railway. A board that can be fitted to the railway is ‘better’ than a computer on the end of a cable. That Java code runs on my (generation 1, 256M with Debian) Pi. Ok it uses about 80% of the CPU but it runs fast enough for the [Java swing, X-based] GUI to be acceptably responsive. There is even a little memory free. The *REAL* trouble is when I startup the serial port (USB dongle) that handles the comms to the interface hardware. The CPU instantly hits 100% and stays there. I am also waiting for the displays because they can be useful on a model railway too. – Are there any plans for SDK or a development environment to create applications specifically for Raspberry Pi? – The B+ version has interestingly shaped wires (vias?) coming in the lower right direction from the processor in a kind of zig-zag or step-wise fashion (just above “I” in “HDMI” caption). What is reason for not making them straight? – Recently, there was circulating this news about “lowRISC”, an open-source SoC. It listed several people from the foundation working on it. Eben also recently mentioned that there might be a new major version of the board in 2017. Is there any connection between these two initiatives? Are there any plans to create a fully open CPU/GPU for the next version of Raspberry Pi? Looking forward to the answers and thanks a ton for putting so much energy into the project! My best wishes to all the people involved. Hi Mike, I can answer the question about lowRISC right now. Last week we posted an FAQ at http://www.lowrisc.org/ which should clarify where lowRISC stands in relation to Raspberry Pi. Additionally, I wouldn’t expect our initial iteration to include a GPU. I am not an employee of the Raspberry Pi Foundation, but remain, as ever, a volunteer contributor. 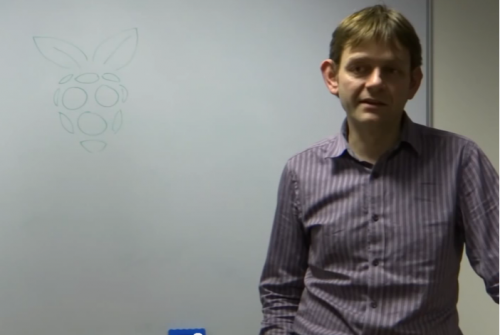 Rob was a co-founder of Raspberry Pi and previously a trustee, but has now stepped down to focus on other projects (such as lowRISC!). That is for track length matching. If you directly route signals on a PCB some tracks are short, others are long. For very high speed interfaces all tracks must be the same length otherwise the signals do not arrive ‘at the same time’. You can not make the long tracks short, so all that you can do is make the short tracks longer using zig-zag. You find the same zig-zag on the B all around the processor. – the new desktop ‘maynard’, when will this be released ? – there was a web browser announced recently which should replace midori and become the new standard browser. When will this be completed ? I provide some large web pages for a school with many pics/svg embedded, and midori loading time is too long with 20sec++. Update on the official dosplay??? #2 Any plans on Pi Certified trainers for a train the trainer model for spreading Pi to the masses. I know that this is similar to the concept behind the Pi Academy. I am speaking more of an online course for anyone wanting to help spread the Pi Word. Then Pi Training Centers around the world. #3 Who would you want to be stranded on a desert island with from the Pi Crew? and why? Thanks for all the Raspberry Pi buttery goodness you guys have created. Multiple Pis for distributed data processing? People are still finding new and interesting ways to extract more performance from the Commodore C64 (sssh, we couldn’t afford a BBC and anyway, it’s better!) some 30 years after it came out. How much performance do you think is left to extract from the VC4 and ARM11? Are we at 50% of the maximum? 80%? I guess there many things you think could be done but that haven’t been yet, but do you think people will ever dip in to the dark corners of the silicon and blow you away with something new or is it just too complicated these days? That raspberry looks like it has floppy bunny ears. Loads of questions probably most are unanswerable or have already been answered on the forum? Some may sound smart some maybe stupid I could think of more but am not going to take more than 10 minutes writing this, please forgive spelling/grammar/thought mistakes. 1) What do you think needs most improvement on the current pi? 2) What are features in order of importance that the foundation are considering to add for the next gen pi? 3) What areas do you think need most educational investment for the UK’s future workforce and how can pi help? 4) What infrastructure software/api/toolkits do you think needs most improvement on the pi to enable better performance or easier programming access to the hardware? 5) What parts of the pi are most likely to be deprecated in nextgen pi? 7) Is the foundation considering creating more development bounties, would be nice if a wishlist of software improvements was created with guestimates of work required relevant information and links and rewards for task completion in some sort of wiki like page that can be edited and added to by everyone? 9) Which competitor products do you most like, what features would future pi hope to copy from competitors? 10) How much has the foundation spent on software development? 11) Do you think broadcom is becoming more favourable to linux support due to the rpi success will broadcom be offering more possible support or even custom chip design for a future pi processor? 12) The dsi display seems to have taken a long time coming is dsi the future, will it be staying for many generations of pi, why was dsi chosen over lvds will firmware allow other screens to work once dsi is released? 13) When the pi/dsi are fully developed/integrated will there be low profile tablets available, possible partnership with OLPC which seems to have similar goals to the foundation? 14) What do you feel is the single most important concept of the pi (low price)? 16) What is the hardest part of your job individually, what is the hardest thing the foundation has had to do to get the pi on the market. 17) what do you feel is the one biggest strength of the processor hardware used in the pi? 18) Is there enough example code for beginners to start working from and is there enough documentation of how the hardware and software works? 1. When fully GPU-accelerated desktop GUI will be available? 2. How about the development of SDK support and/or libraries for getting complete open access to the GPU processor? GPU is of interest since lot of signal/image processing and control algorithms could be realized using its capabilities. For example fast matrix multiplication, convolution/correlation is needed very much. Is the “C64” right next to the GPIO connector on the B+ an acknowledgement that the Commodore 64 was, in fact, the best 8-bit hacker’s machine?! Do you plan smaller devices with less GPIO, but, well, just smaller? What is the most suprising use case that has been observed in the classroom? I am taking the most non-traditional non-compsci learning application. And, what types of support resources do you feel best encourage active participation from teachers and schools? 1. Can someone explain to me how the Pi configures the GPIO mode settings (IN, OUT, ALT0, ALT5) at boot time? Is there a config file somewhere? At what stage in the bootup does it happen? How can I change the default settings, so that it remembers how I want it when it next boots up? I’m guessing this will be related to how it handles the config information provided in the HAT eeprom on B+ add-ons. Can you confirm? 2. The schematic for the Pi suggests that there are two CSI camera channels available, but only one is easily accessible through the camera connector. Are there any plans to give the Pi stereo vision in future, or can’t/won’t it work like that? 1) When might Eric Anholts work get integrated into Raspbian ? Also doesn’t that mean we will get OpenGL and GLX support ? using them to build a SDK or using them as part of your educational resources ? Is there any plan to support the Jam community in a bit more of an official capacity on the website? Would love to help, if so! There is – we’ve just not had enough bandwidth to do the work required yet! Could you drop me an email tomorrow (Friday) when I’m back in the office? I think we should talk! I thought the whole point of Pi was to tinker at every level, and therefore learn by so doing. That’s been the basis of it’s success too, driven by those of us who had no choice but to, in the 80’s. and which we saw the opportunity to introduce the magic to our children. Being actually useful to prototypes and industry helps enormously in the fact that newbies want to play with what the big boys are using so there is a growth path of relevancy they can rely on. the cement at the bottom of the wall is known to be the same at the top. this is good. However, within the ranks of PiDom, we already see the the culture of the “sealed shiny bigger better faster gimme-it-now” developing. Even here in the replies. Thats what we’re trying NOT to engender. Does the Foundation recognise that this is happening and there is stuff you can overtly and covertly do against it ? If ever i come up with something worthwhile to share, i wouldn’t reveal everything about it. I’d post the code as pseudocode, not instant gratification for the gimme-copy-paste brigade. Make ’em think about the workings of the algorithm they are creating. Give a performance specification rather than a line by line how to. let ’em do the wrong thing by nesting the FOR NEXT loop incorrectly, so it eats them up all afternoon. That’s what we did. what’s the point of using someone else solution? Even if your solution is exactly the same, it is still uniquely yours. I know that involves Intellectual Property issues that we will have to rock the establishment boat with, but remember we are training up . Could the foundation may consider publishing a brief sharing documentation standard, demonstrating with examples how to share work while keeping within the spirit of what i’m trying to outline? i may continue this as a thread in the forums ..
should read:. training up people like this. with the url being under the last two words. I wish we could have a small window in time to edit ( or even withdraw ) our posts. next question is: when is that gonna happen? Q1) Can the foundation comment on the progress/plans/release date for a full hardware acceleration OpenGL driver integrated into Raspian? Q2) Can the foundation consider releasing an alternative desktop image based on XFCE4 for Raspian? Are there plans for a low power display? That would be good for off grid locations in the developing world and mobile projects. I am building an app which requires the NFC. So, I just got myself a Raspberry Pi B+ today, I am need some guidance on what should I get for NFC reader which can directly interact with the smartphones having the NFC as add on to the raspberry pi b+ which i can directly plug in. I am a programmer so have no idea regarding the chip and soldering stuffs.